Leasing accounted for 28 percent of new-vehicle financing in the first quarter this year, up from 24 percent a year ago, Experian Automotive said. 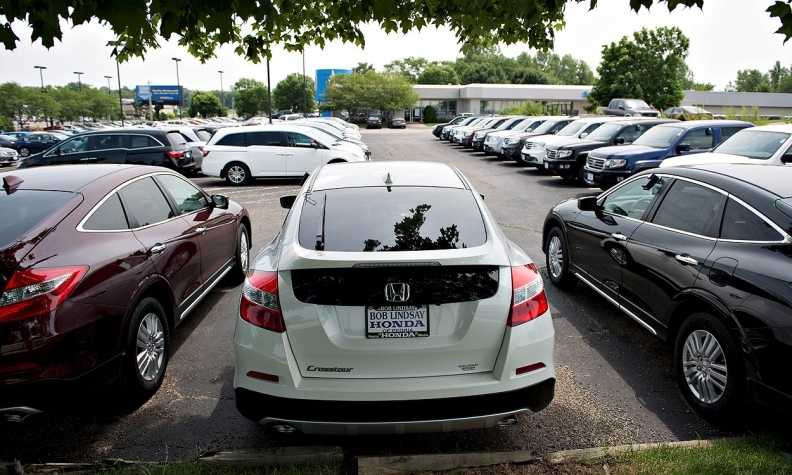 Some of the biggest banks in auto finance boosted loan volume in the second quarter as U.S. light-vehicle sales rose 9 percent from a year earlier. Wells Fargo Dealer Services reported record second-quarter auto loan originations of $7.1 billion, about 9 percent higher compared with the 2012 period. Chase Auto Finance said its loan and lease originations rose about 17 percent in the quarter to $6.8 billion. Chase Auto provides private-label financing, including leasing, for the Jaguar, Land Rover, Subaru and Mazda brands. It quit all other leasing in late 2008 when many lenders exited or cut back on leasing as a result of the downturn. Chase said its total loans and leases combined represented higher share. Capital One reported that auto loan originations rose 5 percent to $4.5 million in the quarter. Bank of America also said its auto loan volume increased in the second quarter, but not enough to offset a decline in credit card borrowing. Bank of America doesn't break out auto loan volume from other consumer loans. Wells Fargo was the No. 3 auto lender in terms of new and used volume combined in the first quarter of 2013, the most recent quarter available, behind No. 1 Ally Financial and Toyota Financial Services, according to Experian Automotive. Chase Auto was No. 4, Capital One was No. 8 and Bank of America was No. 9. Ally said it expects to announce second-quarter results July 31. One large regional bank in auto finance lost volume in the second quarter this year. Huntington Bank of Columbus, Ohio, reported auto loan originations in the quarter were down 3.4 percent to about $1.1 billion. Huntington's core auto loan business is in a five-state area in the Midwest, but it makes indirect auto loans through dealerships in 16 states, including in New England. The company said an uptick in leasing in its core markets took a toll on business. Huntington also stopped making new leases in late 2008. "Clearly there's been a mix change," Nick Stanutz, auto finance group director at Huntington Bank, said last week. "More cars are being leased. As a result in these five core markets, there are not as many loans available, so our market share is down." Nationwide, leasing accounted for 28 percent of new-vehicle financing in the first quarter this year, up from 24 percent a year ago, Experian Automotive said. That was the highest since Experian started tracking leases in 2006. Experian hasn't reported detailed statistics for the second quarter yet. In addition, Stanutz said, Huntington has stayed with superprime loans, so it hasn't participated in the comeback in subprime, either.